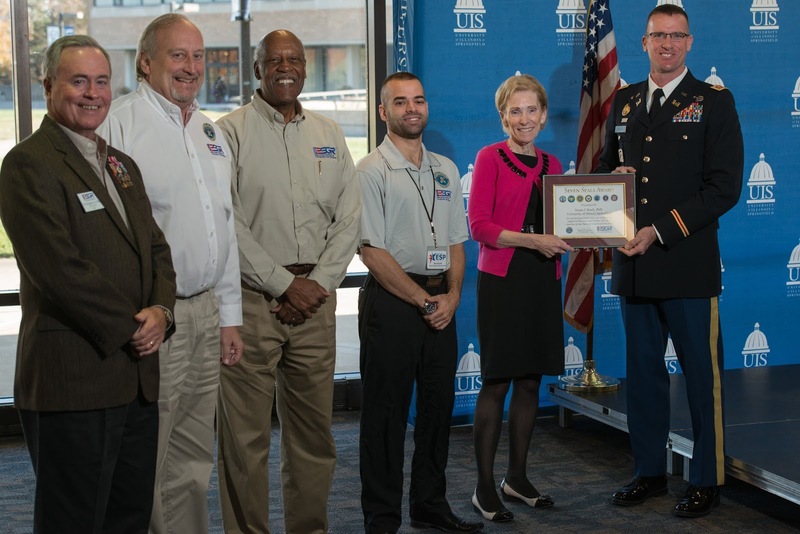 University of Illinois Springfield Chancellor Susan Koch and two other campus leaders were presented with Seven Seals Awards from Employer Support of the Guard and Reserve (ESGR), a program of the U.S. Department of Defense, for their efforts to support military/veteran students and staff during a Veterans Day ceremony on Nov. 10, 2017. The other staff members presented with the award were Clarice Ford, UIS vice chancellor for student affairs, and Mark Dochterman, director of the UIS Volunteer and Civic Engagement Center. The awards are in recognition of UIS’ work to increase support for veterans and active duty service members over the past year. Some of the new UIS initiatives include creating graduation cords for veterans, working to reduce/eliminate fees and holds for students taking advantage of military benefits, revitalizing the Military and Veterans Club and establishing the Student Veterans Advisory Committee. Dochterman also participated in the ESGR Boss Lift in August where he had the opportunity to attend an employer/supporter recognition event and ride in an Illinois Army National Guard Black Hawk helicopter in order to better understand what service members do while on duty. The UIS staff were nominated for the awards by Stan Zielinski, the long-time Illinois ESGR Committee Central West Area Chair who earned his bachelor’s degree in liberal studies from UIS in December 2016. Zielinski passed away in September. Attending for the Illinois ESGR Committee were volunteers Dr. Allan Woodson, Col (Ret) Tom Murgatroyd, and Dave MacDonna along with MAJ Loren Easter, Illinois ESGR Program Coordinator and Tom Korth, Program Support Specialist. MacDonna serves as Public Information Officer for the Illinois Department of Veterans Affairs. This semester, there are more than 300 students who attend UIS who are in the military or have veterans’ status. The ESGR Seven Seals Award recognizes significant individual initiative and support for National Guard and Reserve Component members.